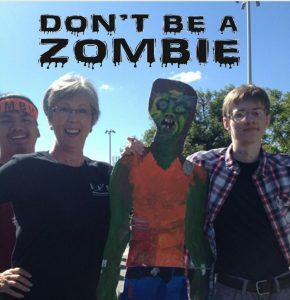 As my favorite season winds down, I have a chance to reflect on my love of zombies. DAC was lucky enough to be part of a screening of “Shaun of the Dead” at the Kenworthy Performing Arts Center. Zombie Fest is becoming an annual thing, it’s fun to hunt down the different type of zombie film….which lead to our search for an inclusive zombie film where even some of the zombies have disabilities. Trust me. There aren’t many. Which led me to think of how we interact with people with disabilities. That’s how we came up with the Don’t Be A Zombie! campaign. Some people seem to loose their brains when suddenly interacting with the disabled. Silly, since they are just like other people. But are they? That led me to read about Doug Hingsburger, a wheelchair user who is also a blogger. He has Zombie Powers. No one ever told him about Zombie Powers. But moving around the world in a different way from others seemed to lead to this discovery of Zombie Powers. Sometimes he forgets that he has them, sometimes they seem to go dormant but at other times the powers are full strength. I see you sneering disbelieving face. He has evidence! 1) His friend was pushing him down a wide hotel hallway. A woman so thin that she’s invisible sideways, saw them coming and suddenly throws herself into a doorwell, flat up against the door. It was like some invisible Zombie force picked her up and threw her against it. Oh she tried to make it like she did it herself by smiling and asking if they had enough room. Like the hallway wasn’t wide enough for two wheelchairs to pass without touching. 2) He went shopping in the mall. Several times when he turned down an aisle whole families stopped. Frozen. His Zombie Powers had taken their ability to move away. When he caught their eyes they all looked like they were considering what they should do – should the run, should they stay, should they look away? They acted like they had so many competing impulses they ended up frozen in place. He just had to wheel around the warm bodied statues and continue on his way. He assumes the power of movement comes back to them after he leaves, but he wouldn’t know. If you have something for the newsletter please email us at dac@dacnw.org.